For over a century, the Tomb of the Unknown Soldier has been America’s most cherished and revered military shrine. 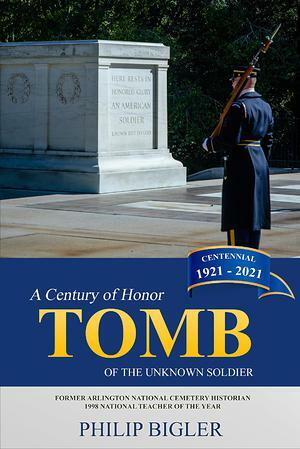 The dramatic story of this magnificent monument is skillfully told by historian Philip Bigler, in his highly readable, narrative account: Tomb of the Unknown Soldier: A Century of Honor, 1921-2021. In his book, Bigler chronicles the Tomb’s history from its early inception after World War I through its formalization and beautification. The shrine’s symbolism and continuing cultural importance are explained, while the subsequent interments of the World War II, Korean, and Vietnam Unknowns are covered in detail and framed within the context and scope of the nation’s history. Bigler spent over two years conducting extensive primary source research at the National Archives, the Eisenhower Library, the Library of Congress, the Commission of Fine Arts, as well as at other important historical repositories. From 1983 through 1985, Philip Bigler served as one of the official historians at Arlington National Cemetery. During his tenure, Bigler assisted with the burial of the Vietnam Unknown Soldier and worked on two visits by President Ronald Reagan. Among his many duties were document preservation, research, and public speaking. The historian’s office also served as a liaison between Arlington and various veteran groups, news organizations, Congressional staff, and foreign embassies. Mr. Bigler returned to teaching in 1985 and taught history and humanities for 23 years in Montgomery, Maryland and Fairfax County, Virginia public schools. In 1998, he was named the National Teacher of the Year during a White House Rose Garden ceremony hosted by President Bill Clinton. He later served as an assistant professor and Director of the James Madison Center at James Madison University. A prolific writer and skilled educator, Bigler is the author of ten books, including the highly acclaimed In Honored Glory: Arlington National Cemetery, the Final Post. He has been a featured guest on Nightline with Ted Koppel and the Late Show with David Letterman and has provided historical commentary on the History Channel, CNN, CBS-Newsmark, and Fox News.